Media coverage of the Syrian Kurds is largely a romantic narrative of brave and plucky soldiers -particularly photogenic female fighters and a selfless cadre of idealistic foreign fighters – in an egalitarian para-socialist, anarchist-lite reimagining of the Paris Commune overcoming poor odds against a resilient and vicious barbarian foe, threatened by traditional enemies to their rear, and about to be betrayed by their fair-weather allies. Some on the left cleave to a narrative that conforms with pro-Assad, Russa-aligned reportage that views any opposition to the legitimate Syrian government and its popularly elected President Bashar al Assad as either criminal or deluded, and a cat’s paw of western interests. With US policy with regard to its erstwhile Kurdish ally in constant flux – some would describe it as floundering – here is a brief discussion on what or may not happen next. As is often the case in Middle Eastern affairs, and particularly in sad, shattered Syria, it may well be redundant tomorrow. But first, how did we get here? The Kurds are a distinct ethnic and linguistic group spread across northern Syria, southeast Turkey, northern Iraq and northwestern Iran. At the end of World War 1, with the disintegration of the multinational Austro-Hungarian, Russian and Ottoman empires, the Kurd’s representatives joined delegations from many other small nations demanding their own independent states. Unlike those in Eastern Europe, the Kurds were to be disappointed. Britain and France has already determined to divide the Arab provinces of the Ottoman Empire between themselves, and with Treaty of Sèvres of 1922, Kurds were subsumed into the new states of Syria and Iraq. Kemal Ataturk, having ejected Greek and other forces from Anatolia and established a unitary Turkish state, had no intention of allowing the Kurds in the east their own patrimony. And neither did the Persians (the country did not adopt the name Iran until 1935). For almost a hundred years, the governments of Iraq and Syria, Turkey and Iran, for reasons strategic, economic, political and nationalistic, resisted the demands of their Kurdish citizens for autonomy let alone nationhood, and indeed actively discriminated against them. Dissent and rebellion were suppressed, often brutally, well into the 21st Century. The Turkish and Iraqi armies have waged war are against their restive Kurdish populations for decades. After the second Guif War (the Kuwait one),Iraq Kurds were able to establish an autonomous statelet aided by a US underwritten no-fly zone. The Kurdish PeshMerga forces sustained the bitter fight against a seemingly unstoppable Da’ish after Iraqi forces had fled the field and extended military and administrative control beyond their own territory. Syria’s Kurds were able to exploit the chaos of the civil war to establish autonomous cantons in the north-west aground the city of Afrin, and in the Syria-Turkey borderlands in the northeast, now known as Rojava. Having borne the brunt of the fight against Da’ish, armed by the US and aided by allied air power and special forces, they earned the ire and suspicion of Turkish prime minister and now president Recep Tayyib Erdogan, who for his own political purposes, had broken a longstanding truce with Turkish Kurds, branding them as terrorists, he maintained, in cahoots with their equally terrorist Syrian confrères. Taking advantage of the Syrian Army’s preoccupation with al Qaeda-aligned opposition forces in the northwest and a US policy vacuum with respect to Syria, and with the tacit approval of Syria‘s Russian ally, Turkish forces occupied Afrin and its surroundings. The US reliance on the Kurdish militias who bore the brunt of the fight against Da’ish in northeastern Syria, and the presence of a small US force have deterred Erdogan from moving against Rojava. Until recently, that is, when US President Donald Trump declared that the US would soon withdraw its 2,000 ground troops from Rojava, leaving the Kurds vulnerable to Turkish attack. Erdogan assured him that his forces would not move against Rojava … yet. The outcry among America’s allies was immediate. How could the US treat its allies so? What message would this send to potential allies in the future? The US would be handing Syria to Russia and Iran. Da’ish was not dead yet and would be reinvigorated by a US retreat and a conflict between Kurds and Turks. Backtracking somewhat, Trump has now threatened Turkey with economic destruction should it attack the Kurds. This then is the current state of play. The Kurds are caught between a Turkish rock and a Syrian hard place, they can fight (they’ve a large, experienced, well trained and well-armed army, an esprit de Corp that few others possess) or they can deal – with Assad, that is, because Erdogan won’t play – for a degree of autonomy within the Syrian fold. The US might offer a no-fly zone which will interdict warplanes and choppers, strafing and barrel bombs, but wouldn’t stop tanks and infantry from manoeuvring with impunity. Kurdish forces would probably hold those off, and meanwhile others might be tempted into the fray. The resulting ground war could see neighbouring armies, Russian mercenaries and western special forces bogged down like the Americans were in Vietnam and the Russians in Afghanistan. In their presently autonomous ‘commune’ of Rojava in north eastern Syria, the Kurds are not in the strongest strategical or geopolitical position. It has a sizeable Arab population in, and Turcoman also, and many are not too happy to be governed by Kurds. Divisions are ethic, racial, and tribal as much as political, and there are reports that Kurdish soldiers and administrators have been a tad heavy handed. Arabs and others will no doubt be pining for Assad’s comradely embrace before long. The Kurds themselves are divided amongst themselves, often between families and clan, and rival militias, and have been for generations. In Iraq, for example, two extended families, the Barzanis and Talabanis, have dominated Kurdish politics and have fought each other since Iraq was created in 1922, often siding with the Iraqi government against their rivals. The provincial capital of Kirkuk in northern Iraq was occupied by Barzani-controlled forces during the successful offensive against Da’ish, but was recently taken by Iraqi forces with the help of pro-Talabani Kurdish soldiery. Rojava, furthermore, is landlocked, and strategically placed between Turkey, Iraq and western Syria, and there are oil reserves and agricultural land that Syria would want back. Syria, Iraq, Iran and Turkey all loathe the idea of an independent Kurdistan and indeed, could work together to enforce a blockade and ferment discord within. Russian president Vladimir Putin is backing Assad’s campaign to reconquer all of Syria, and that includes Afrin, now Turkish occupied, and Rojava, which is currently being watched over by the US, and eyed-up by Erdogan. But Assad’s forces are currently preoccupied with retaking Idlib province from al Qaida and other Islamist groups and eliminating Da’ish hold-outs near Hama and in the south, so right now, they are not ready or able to move on either Afrin or Rojava. The Turks are quite aware that the Russians are reporting to Putin and also to Assad, and have been kind of warned off by the US, so they might be cautious. The Russians are in effect a tripwire. If the Turks occupy Syrian land, Assad will have to move against them – as will his Russian, Iranian and Hizbollah allies. He is probably already contemplating a move on Afrin, and if the Turks threaten to to occupy Rojava, he will have to move against them there too. And he has a brigade of battle-hardened troops just south east of there at Dier ez Zor. When push comes to shove, Turkey has a well-equipped NATO army, but it has limited battle-experience – fighting a historical Kurdish insurgency doesn’t count, and it’s officer corp has been decimated and demoralized in the wake of the failed “coup”. Assad can field a depleted but experienced, Russian-supplied army backed by Hizbollah and Iranian fighters. The Russians know this, the Americans know this, and one would assume that Erdogan knows this – unless he is totally blindsided by his sultanate ambitions. Academically, this Is all very interesting – but to the Kurds in Rojava, quite scary. They are the small guys and the fall guys in this geopolitical game. They fight hard and well and they fight to win what they can, but they also want to live to fight another day. They are used to betrayal and are probably inured to it. It has been their lot since World War 1 when they turned up at the peace conferences asking for a country of their own just like those other small nations who came into being in Eastern Europe. So they will deal with Assad – to save their skins, to save their towns, their homes and their families. They will endeavour to hold out against any Turkish offensive, buying time and perhaps, buying some for Assad too whilst he rolls up the rebels in the west and south. And whilst they hold on, they will bargain for a degree of autonomy, amnesty, and aid. This is where Russia can call the shots. 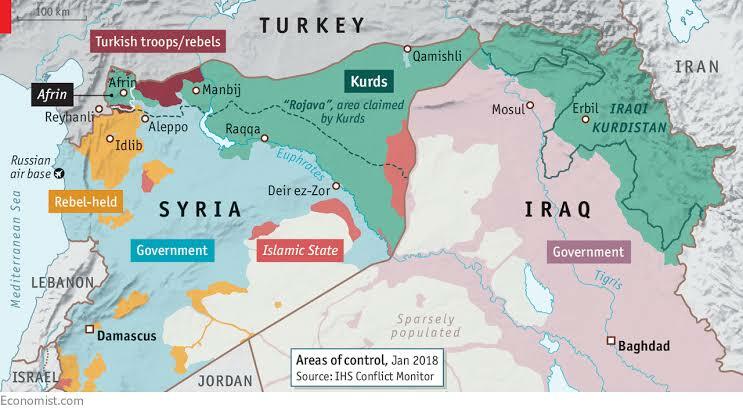 There is in reality no good way forward for the Kurds, but there is a possibility that the worst can yet be avoided if Russia, keen to maintain it’s influence in a post-war Syria, can mediate an arrangement between Damascus and Ankara. Turkey’s bottom line is a border with Syria not under the control of the YPG/PKK, its erstwhile mortal enemy. Despite Erdogan’s jingoistic drum-beating, he probably does not want to occupy Syrian territory nor provoke confrontation with Assad and his allies. Assad wants a Syria free of Turkish (and, indeed NATO) troops and a return of his mandate and mukhabarat to all parts of the country, including the Kurdish north. He can live with the YPG, but only in its “proper” place: as a vassal, defanged, compliant, and a useful ally against Ankara. Can and will the Kurds trust Assad? Never! After seventy years as second-class citizens in Syria, who would? One can but hope that the analogy of the Paris Commune is just that – an analogy only. That quixotic intifada ended tragically for the communards.